The story of Danae and Zeus is one of the most famous stories from Greek mythology, for it is a love story, a romance between a god and a mortal. Zeus was of course the supreme deity of the Greek pantheon at the time, having overcome his father, Cronos, and the other Titans in the Titanomachy. Zeus would rule from Mount Olympus, and by his side was his wife Hera; although Hera was only Zeus' third wife following on from Themis and Metis. Even when married though, Zeus had a wondering eye, and many a beautiful mortal of immortal were the subject of Zeus’ desires. As a result many surviving tales from Greek mythology deal with the love life of Zeus, whilst many of those that involve Hera, see the goddess seeking retribution upon the lovers or children of her husband. ​One of the subjects of Zeus’ wandering eye was Danae, a princess of Argos on the Peloponnesian peninsula. 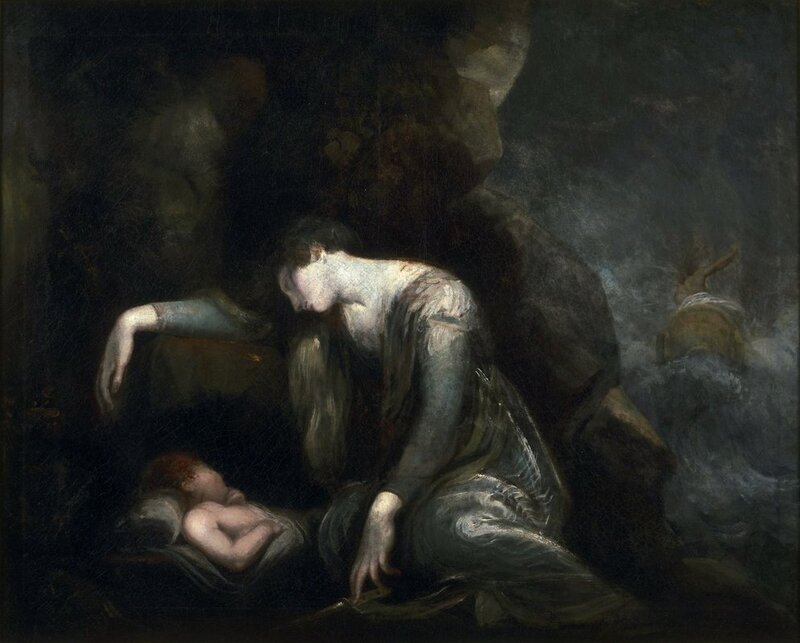 Danae was the only child of Acrisius and Eurydice, the ruling couple of Argos, and as she grew up, Danae gained a reputation of being the most beautiful female mortal of the age. Being Acrisius’ only child though caused the king a problem for this meant that he had no male offspring to leave his kingdom too. Acrisius therefore consulted an Oracle to find out what the future would behold, and specifically whether Danae would ever have a son, who could rule Argos after Acrisius. The prophecy offered up by the Oracle though hardly set Acrisius’ mind at rest, for although Danae was destined to bear a male heir for the king, that son was then destined to kill King Acrisius. Acrisius’ priorities now changed, from being worried about whom to pass his kingdom on to, the king was now worried about his own mortality. There were many cruel kings told of in Greek mythology, but Acrisius was not numbered amongst those who considered filicide. Acrisius’ solution was simple to ensure that Danae would not fall pregnant. Acrisius therefore constructed a bronze tower with a single access door at its foot. The door would be guarded day and night by soldiers loyal to the king, and the bronze nature of the tower meant that it could not be scaled on the outside. Danae was therefore made a prison, all be a comfortable prisoner, by her own father. Tales of Danae’ beauty had already reached Zeus upon Mount Olympus, but the interest of the Olympian god was really piqued by news of the construction of a bronze tower in Argos. So Zeus descended from his palace to the realm of Acrisius. Acrisius had done a perfect job of preventing a mortal from gaining access to Danae, but the bronze tower was not going to stop a god, especially one as determined as Zeus. Thus, Zeus transformed himself into a raincloud, and in the form of a shower of gold, Zeus cascaded through the tower’s roof. Alone with the beautiful Danae, Zeus spends the night with the beautiful princess, and as a result, Danae becomes pregnant. After the allotted time, the relationship between Zeus and Danae brings forth a child, a boy who was named Perseus. Acrisius now has the issue of a grandson to deal with, a grandson who is destined to kill his grandfather. Now once again murder was out of the question, for although Acrisius did not know who the father of his grandson was, he reasoned that only a god could have got Danae pregnant. 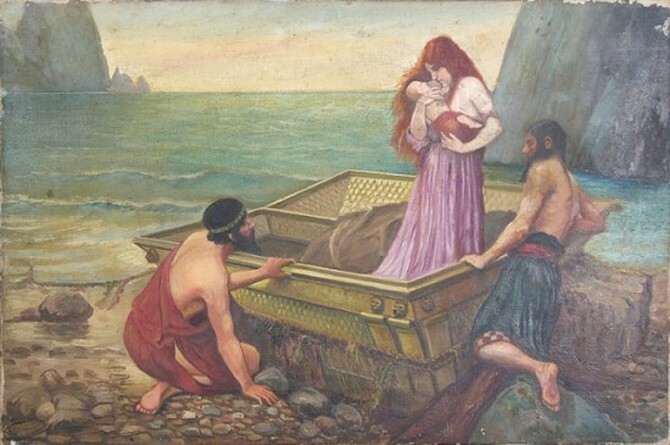 Acrisius’ solution was to place Danae and Perseus in a chest, and then set them adrift upon the open sea. Either the pair would drown, or else they would drift far away from Argos, meaning that Perseus could do no harm to the king. Zeus though would almost always keep an eye out upon the fate of his lovers and offspring, and with the assistance of Poseidon, the god ensured that the chest would safely wash up upon the shore of the Aegean island of Seriphos. The wooden chest was discovered by a local fisherman, Dictys, and the fisherman was soon looking after Danae and Perseus. Now Dictys also happened to be the brother of the king of Seriphos, Polydectes, and it was not long before Polydectes became aware of the beauty of his brother’s houseguest. Polydectes attempted to seduce Danae, but the mother of Perseus rejected his advances, although as the years passed Polydectes was not put off by the continual rejections. Eventually of course Perseus grew up, and soon the son of Perseus was strong enough to ward off the continued unwanted advances of Polydectes. Undeterred, Polydectes hatched a plan to leave Danae unguarded, and Perseus was dispatched on the impossible quest of bringing back the head of the Gorgon Medusa. Perseus willingly went along with the quest for the Greek hero believed that the head of Medusa was to be a wedding gift for the future marriage of Polydectes and Hippodameia. Perseus realised that if Polydectes was married, then the unwanted advances towards Danae would cease. Perseus of course would have his own adventures but the son of Danae would eventually return to Seriphos, and there found a wedding ceremony in progress. The wedding though was not between Polydectes and Hippodameia, for instead the king of Seriphos was trying to marry Danae against her will. Dictys was attempting to protect Danae, but salvation only came when Perseus produced the head of Medusa, turning Polydectes and all his supporters into stone. Perseus would make Dictys the new king of Seriphos, and Danae and her son, and her new daughter-in-law, Andromeda, would travel back to Argos, and at some point Perseus did accidentally kill Danae’s father. Perseus would go on to rule Argos, and become ancestor to many famous figures of Greek mythology. The story of Danae fades away though, although Virgil would state that it was Danae who founded the city of Ardea in Latium. The death of Danae though was never recorded in the surviving sources.